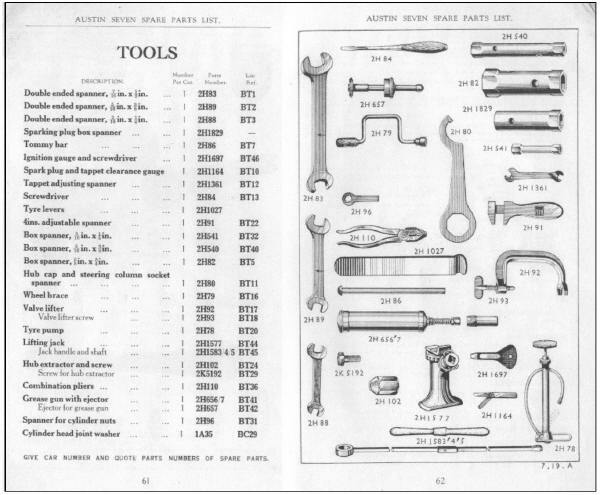 The Austin Motor Co., provided a set of tools, contained in a Wrap aka Tool Roll, with every new car enabling the owner to carry out the Regular Attentions, the Daily, Weekly, Monthly and Occasional Attentions as set out in the handbook, and a few of the easier repairs. 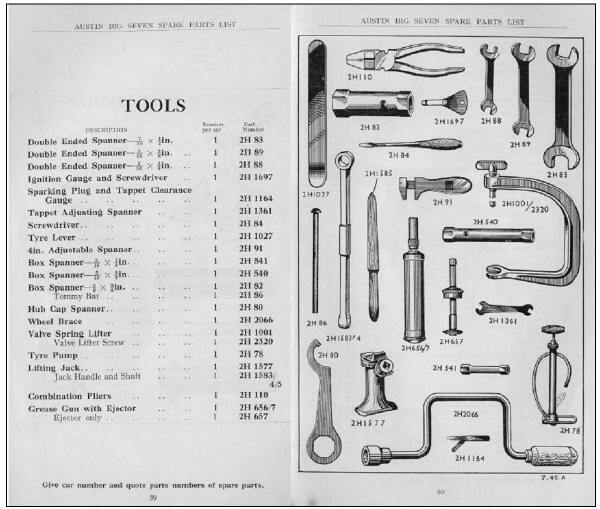 During the production period of the Seven from 1924 to 1939 the basic tool kit remained the same although some items differed from those illustrated, depending upon the supplier at the time. 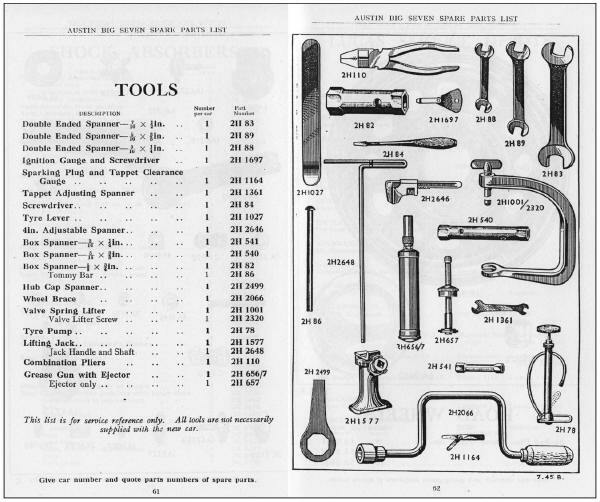 Also some tools were removed from the kit as they were no longer required eg The Magneto Spanner shown in 1925 was no longer required with the Coil Engine. Unfortunately tools would be kept in tool boxes, left in the garage or inadvertantly be picked up by someone else and so few tool kits would remain complete or stay with the car. Anyone buying a Seven 70 + years later is very unlikely to have any tools with the car least of all original ones. Original tools appear on the online market websites as folk clear out father's and grandfather's garage and sell bits and pieces. 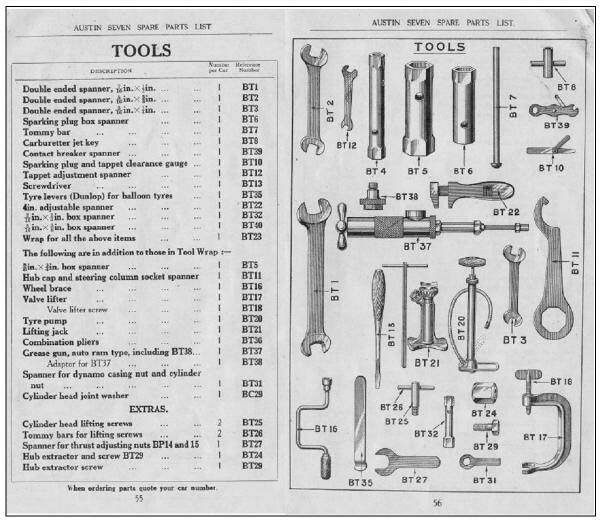 Imperial tools, spanners and socket sets, can still be purchased from suppliers, see Guide to Parts & Services, or at Autojumbles. The tools supplied in the kits are shown in the List of Spare Parts for each Seven model. The earliest lists were the only ones to refer to, and illustrate, a Wrap or Tool Roll. Also shown were 'Extras' whcih could be purchased for specific tasks eg Cyliner Head Lifting Screw and Hub Extractor Screw. Tourer Type AD Nov 1929 List of Spare Parts Publication No: 670b. As Sevens now had a Coil engine the Magneto Spanner was no longer supplied, the diagram of the Wrap has gone, but is still listed as BT23, and the 'Extras' are no longer illustrated. RP Saloon Nov 1933 List of Spare Parts Publication No: 1029A. The grease gun has changed, but the Wrap is still listed as BT 23; otherwise the tools are the same. The grease gun has changed, and the Wrap is not listed, the Lifting Jack has a 3-part shaft with wood handle; Cylinder Head lifting screw and spanner BT 37 have gone otherwise most of the tools are the same. 24 items are listed and parts now have a dual numbering system. 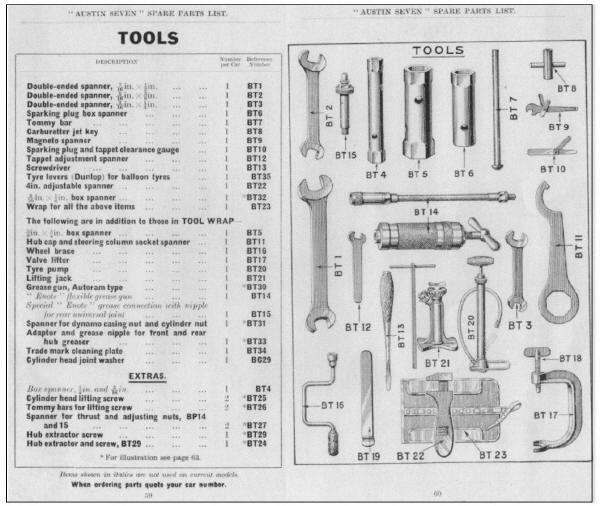 1937 Big Seven CRV Dec 1937 List of Spare Parts Publication No: 1598. The kit is now reduced to 19 items with the 2H numbering system only. The kit is very similar to the one for the ARQ. The kIt varied depending upon the items in stock when the it was put together. The Tool Kit which has survived with my March 1938 Big Seven CRW (Forlite) has separate spanners for Hub Cap removal and Steering Column Socket. The Tyre Pump was also used to pump up the 'Float-on-Air' seat cushions. 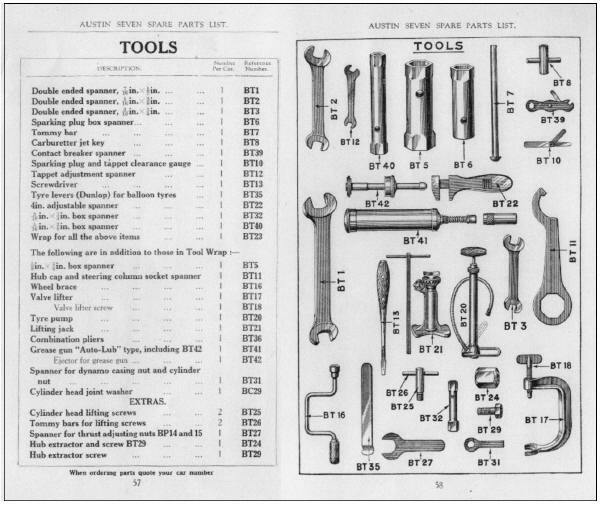 This edition of the List shows the one part Jack Shaft and Handle and a 4" Adjustable Spanner which is a Monkey Wrench, and I have never seen one of this size, they are normally 7".